It’s celebration time! All the of Teal Band project declarations were approved by the start of this week and they are all off running with their project work. 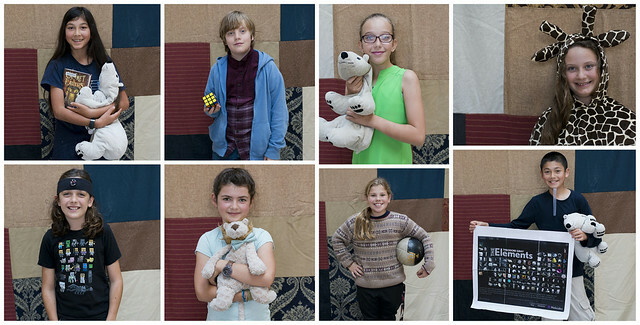 To begin the celebration, here are all their wonderful “school photos” from this year. Teal Band 2016/2017 – You can’t miss how special and unique they all are. 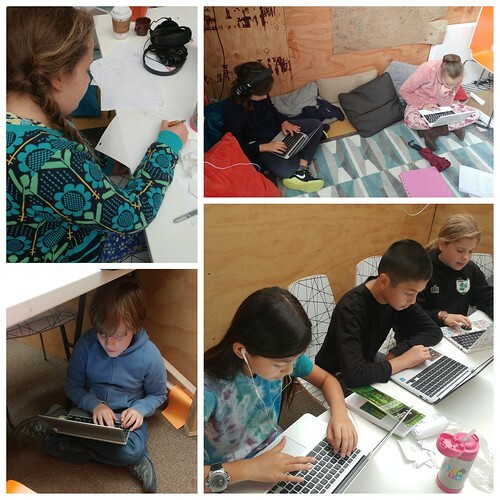 A few of them quickly found out how important it is to check on shipping times of products. When you want a product at a price that fits your budget, sometimes it’s coming from the other side of the planet and won’t arrive until the week of presentations. This realization was a great eye opener in regards to planning and being proactive in general. Huxley used this challenge as a way to re-evaluate his design in a way that pricier parts could be used, but fewer would be needed. Patrick and Jared continued to check in with their expert, Jack, to look for alternatives and find ways to save money in other places. 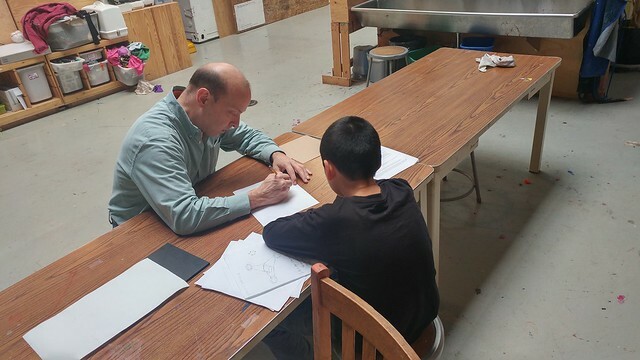 When you need to re-evaluate your design, Gever is an excellent expert. Piper experienced her first Expression Phase moment of “YESSSSS!” this past week while looking at a Google Maps driving route from Slide Ranch to her home. She figured out how she wants to present this portion of her project and it most certainly screams Piper. It’s moments like this that make all the stresses of a project completely worth it. Sometimes it just takes looking at something in a new way to get your best idea yet. Just like naturalists working to track down the story of the urban coyote migration to San Francisco and it’s surrounding areas, Freddie is working to track down her experts to get a piece of the story. We talked early on in the Expression Phase as a band about the importance of making initial contact with experts during declaration writing. Freddie did just that, but as is with many “experts,” they are just so busy with their everyday job responsibilities that they take quite some time to respond to the questions of a student. She is learning to adjust her schedule to work with the schedules of others while still being productive. A skill that will benefit her for a lifetime to come. On top of their “By Land” projects, the Teal Band is still trying to complete their bridge project. 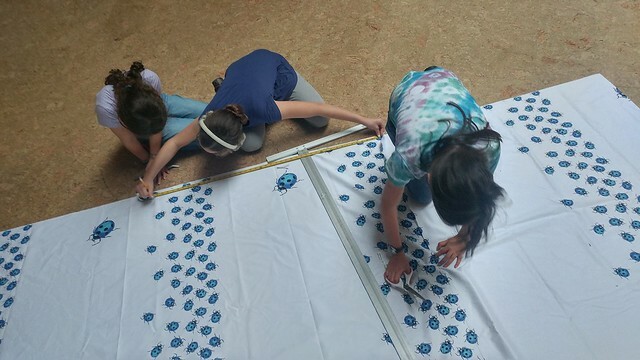 This week they finished measuring and cutting the fabric and began the sewing portion. 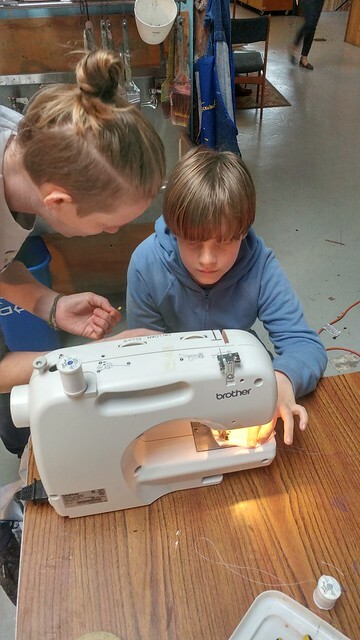 Huxley and Jared got lessons on sewing from Piper and Lindsay while the rest of the band worked to finish cutting the panels. It takes a team to get all the measurements and cutting taken care of. Jared gets a lesson on sewing from Lindsay. The week leading up to winter break and this first week back have been spent preparing for the Expression Phase of the By Land Arc. 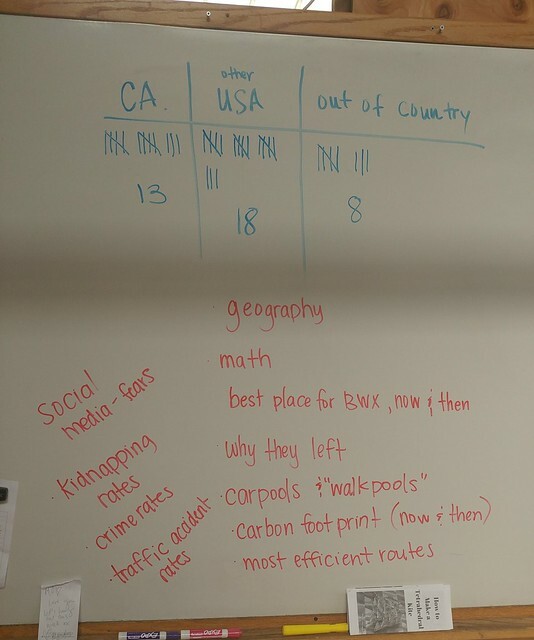 We spent time brainstorming project ideas and the routes to take to complete them. We worked together to create a declaration for our ‘Brightworks on a Bus’ (BOAB) band project. We talked about how the declaration is just as important as the final product. 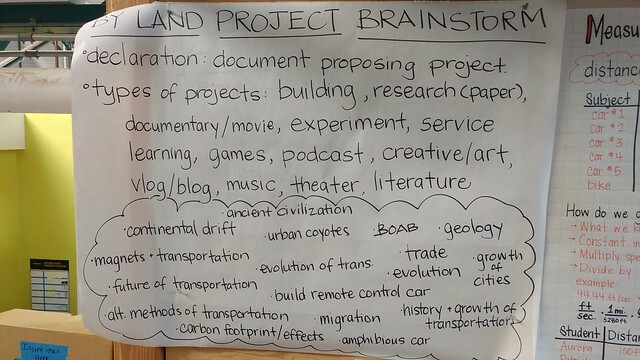 Our By Land brainstorm included types of projects that could be completed, as well as ideas for the project. 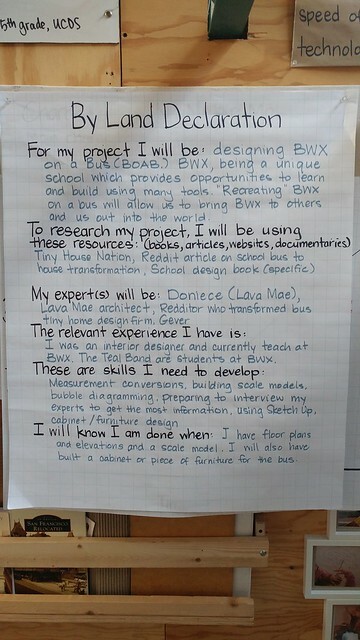 We worked together to write up a declaration for our Brightworks on a Bus project. We talked about how important it is to plan ahead and make time for multiple iterations. 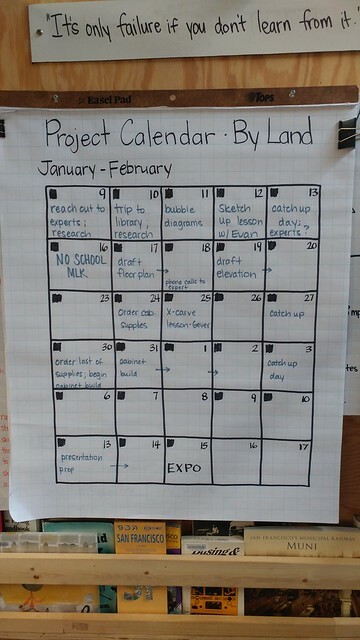 For the next five weeks, the Teal Band will be working on an incredible collection of projects. Here is a sneak peek into what they will be working on. We find it really interesting how ancient civilizations, with their limited supplies and technology, managed to create their own modes of travel and use them to trade and thrive. Even today, people are thinking of new ways of transportation, because without transportation, we couldn’t trade or expand our cities and civilizations. Transportation allows growth, and in ancient times, it was a necessity. For our project, we want to each create our own civilization in three very different terrains, and experiment with different forms of transportation that would best suit our different landscapes. After we come up with a few different forms of transportation, we want to design them in GoogleSketchUpp and create to-scale models. While we are doing this, we will make maps of our civilizations and the civilizations we created will be trading with each other. We will also research what sort of resources there are in our landscapes, and build our civilization off of those. Every day each civilization will gain a certain amount of resources that they can use or trade. Our final product will be to-scale models of three different forms of transportation and maps of our civilizations. We are hoping to build an RC car. Now, the real question is will you let us? Jared wanted to build a remote control car and Patrick wanted to help him through the first real project arc of the year. We decided to build an RC car first because we thought that we should take baby steps until we make a bigger version which you could ride in. Also, it would help both of us learn multiple things and become better friends along the way. How does Slide Ranch get yarn to us? I would make a map to show how it would travel from being on a sheep to nice yarn that can be used and sold. I want to do this project because I love using yarn, and I want to know how it gets to me. I, Fredrica Lipsett would like to propose my by land arc project where I study the migration patterns of urban coyotes and create a map showing their general locations. We have many urban coyotes in the Bay Area and I have always wondered, “How did they get here?” So, for my project I would like to learn why they have migrated here over the last number of years. I would also like learn about their habitat and how people track them. 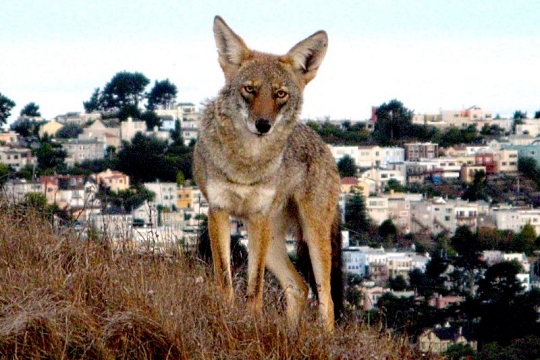 I’m interested because at Bernal Hill (where I live) there is a coyote living there and I am intrigued about how it got there. We have 70 Coyotes in San Francisco but no one knows if they came as a pack or if they came from different places in California and beyond. Dispelling fear of Maglev technology/electrodynamic suspension. A Maglev is a high-speed train that uses repelling magnetic fields to levitate. The lack of friction allows Maglevs to achieve speeds of 603 km/h, while using only around half the energy a normal bullet train needs. The Maglev is far more efficient, less polluting, and much faster than any other type of train, so why aren’t we seeing them everywhere? Because most humans are afraid of the unknown, and therefore afraid of change. Protests have been set up because some people believe that they will be bombarded with harmful radioactivity from the Maglev. No scientific research supports this, and yet the protesters still believe, because they are afraid of the unknown, and new emerging technologies are classified as unknown. The same scenario is happening with self-driving cars, and has happened with smartphones. In order for Maglev to become a reality, we need to dispel this fear. To do this, I propose that we make an RC toy, using Maglev technology. The eddy currents will create a magnetic field that opposes the magnetic field that created it. A series of electromagnets in a ring, pulsing at specific times, could create this spinning magnetic field. If provided enough energy, this should keep a small vehicle aloft. Other rings of electromagnets on the sides of the vehicle could be pulsed in order to steer. The Teal Band has covered a lot of ground in the last couple weeks. Everything from plucking ducks to calculating speed. The band has continued to analyze the data they have collected with their “Getting to School” questionnaire. 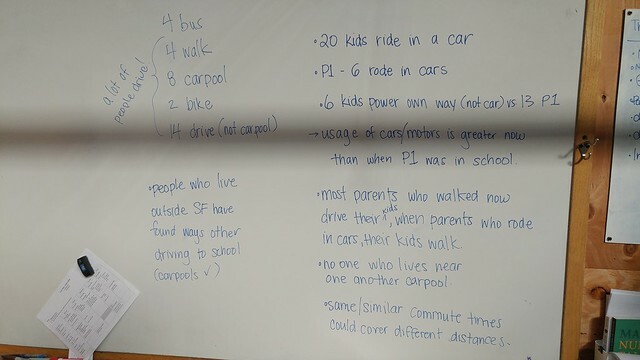 Information such as how many students per band travel to school by car, compared to how many of their parents was recorded. 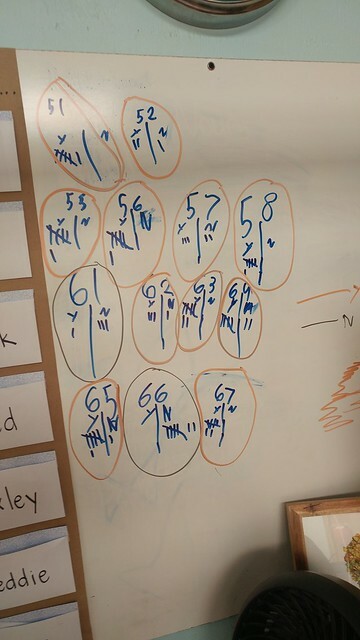 Huxley and Nora found that the graph of the students followed a very similar pattern to that of the graph recording the parents’ information. 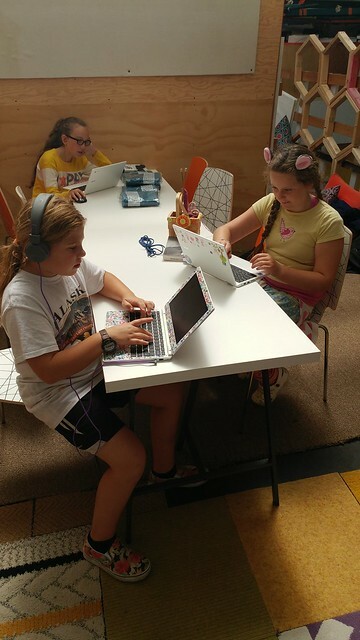 A number of Teal Banders, including Piper, Freddie, Aurora, and Selina, learned to use Google Maps to create maps documenting where everyone comes from. This information was also used to find the geographical midpoint of all the locations in hopes of determining the “ideal” location of Brightworks geographically. Nora and Huxley decided to create a graph to represent their findings around the students’ and their parents’ journies to school. Piper maps out the locations that students come from everyday. 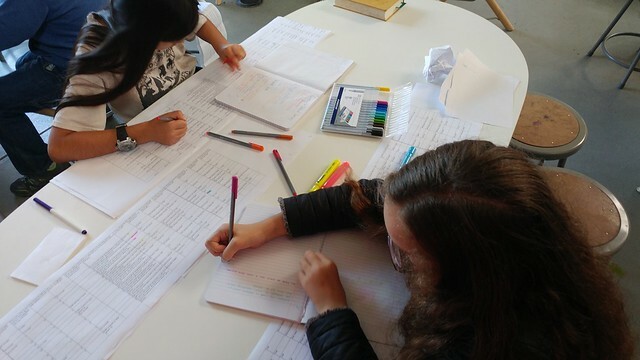 Selina and Aurora took some time to take notes on their discoveries while looking over the data. Further work was done using the data to calculate the average speed it takes certain students to get to school in the morning. Since the travel time for each student was not provided as an hour, but instead in the various number of minutes it takes them to commute to school, the Teal Band had to figure out how to convert their speed to miles per hour. 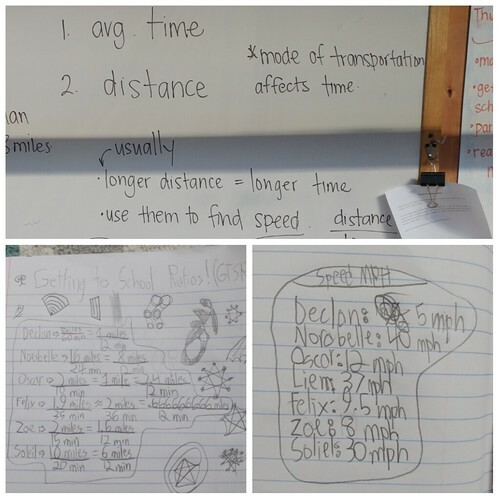 Similarities began popping up around the different modes of transportation, along with their distance from school, in relation to their average speed. Teal computed the speed of a number of students, converting it from miles per minutes to miles per hour. 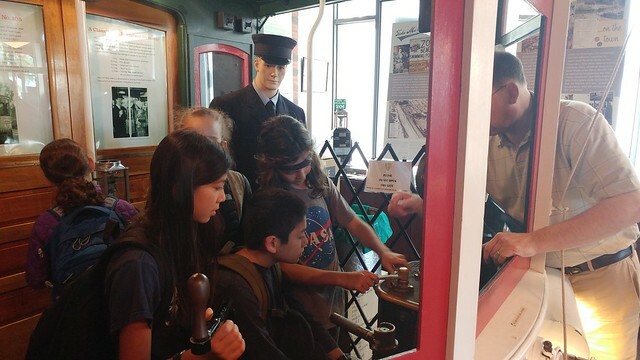 Stepping back into history a bit, the Teal Band took a look at San Francisco’s transit history. They spent an afternoon exploring a timeline of events and recorded the events that stuck out most to them. 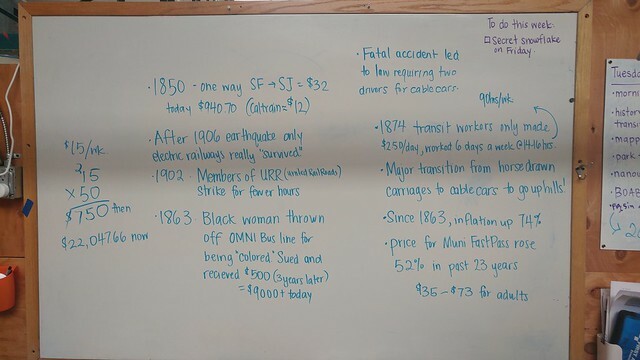 They were intrigued to see how the cost of San Francisco transit has changed over the years and researched inflation rates, adjusting a number of the costs to compare them to today. They were quite surprised to see how much more expensive it was to take transit in the past compared to today. Jared took notes on what he found most intriguing about the transit history of San Francisco. Just a few of the interesting tidbits of San Francisco transit history we stumbled upon. 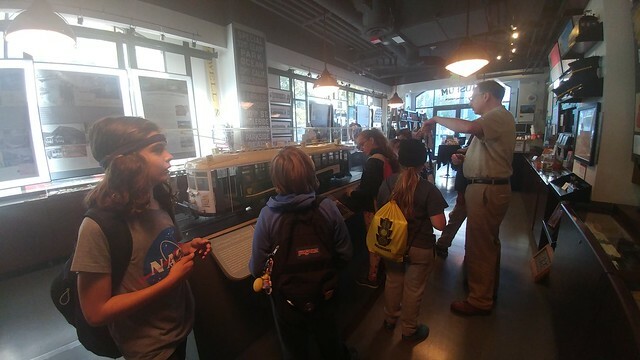 The band took a field trip down to the San Francisco Railway Museum where they received a lesson on driving one the earliest San Francisco street cars. Something that the band didn’t expect to learn that day, was that the older street cars had ‘people-catchers,’ like the cow-catchers on locomotives. Jaywalking was extremely common during that time and before the ‘people-catchers’ were added to the street cars, people would be hit and run over often. The ‘people-catchers’ saved many lives. Getting a lesson on driving an early San Francisco street car. The Teal and Orange band took a little break from their usual “By Land” routines to pluck and eviscerate two ducks (with one of them eventually becoming my Thanksgiving dinner.) The experience of plucking the ducks was exciting. There were so many different sized and colored feathers. The down was so incredibly soft. And, no one will ever forget the “bloody worm” that would emerge from the pinfeathers (developing feathers) when the quill was squeezed. Once the plucking was complete, a process that took patience and thoroughness, the band had a lesson on the evisceration of both ducks. 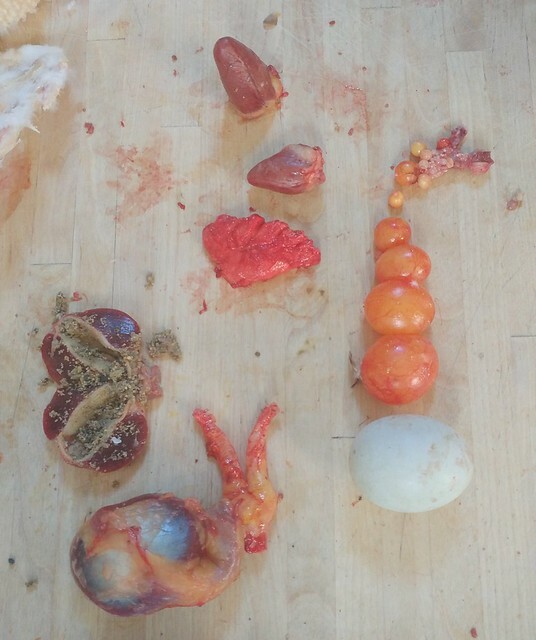 They got to see, feel, and smell a number of organs, including the heart, lungs, intestines, gizzard, and liver. The female duck provided the most interesting discovery, the egg production chain. Plucking a duck took some real dedication, patience, and focus. The down was so unbelievably soft. 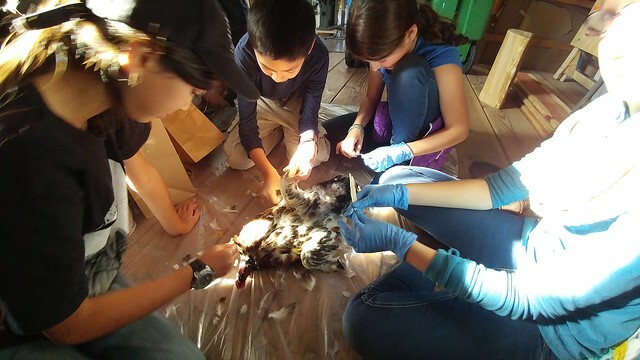 The process of evisceration allowed the Teal Band to see a number of organs from the intestines to the liver to the heart. The ducks not only provided a biology lesson and food, but also a math lesson on ratios. 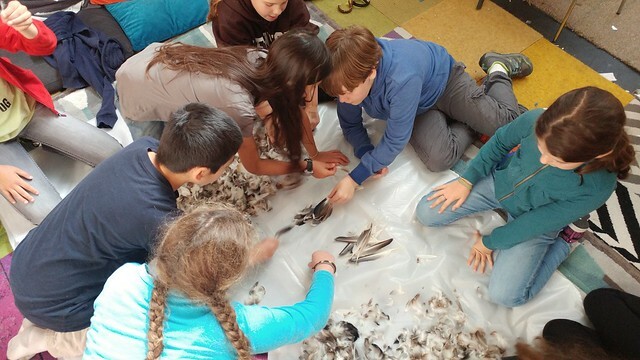 The band worked together to figure how they wanted to sort the massive pile of feathers. They decided to sort them into three groups by size: small, medium, and large. After counting each of the groups, they explored ratios, a comparison of two different quantities. 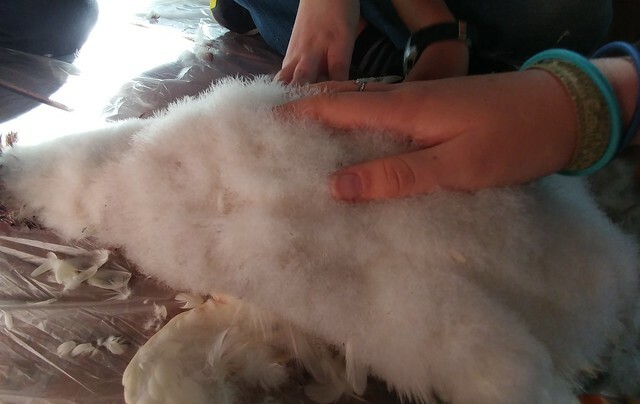 It was interesting to find that while there were only twice as many medium feathers as there were large, there were seven times as many small feathers as large feathers. Taking the ratios a bit further, the band converted them to fractions and discussed the relationships of ratios, fractions, decimals, and percents, along with where we tend to see or use each form every day. 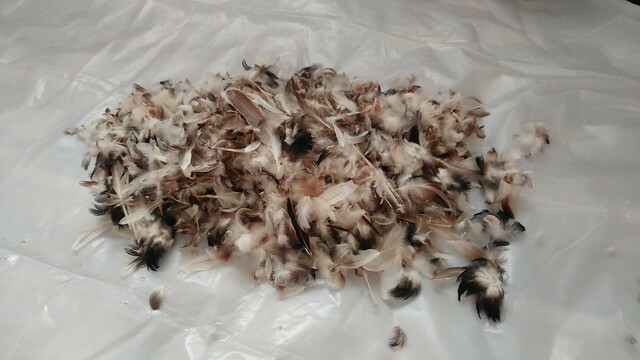 Two ducks produce a lot of feathers. The Teal Band decided to sort the feathers into small, medium, and large. 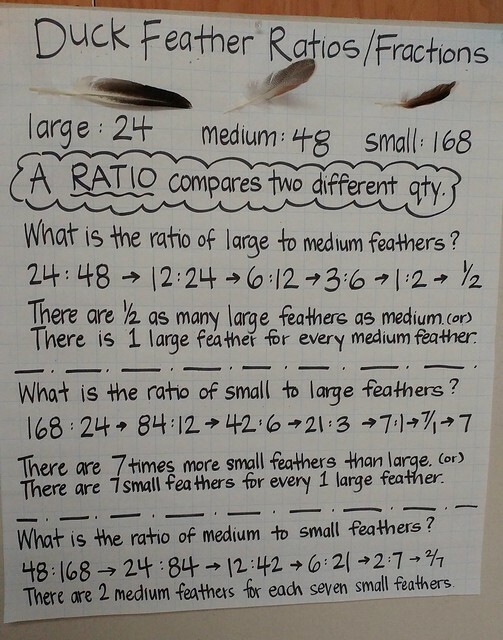 Exploring ratios with the duck feathers we plucked. 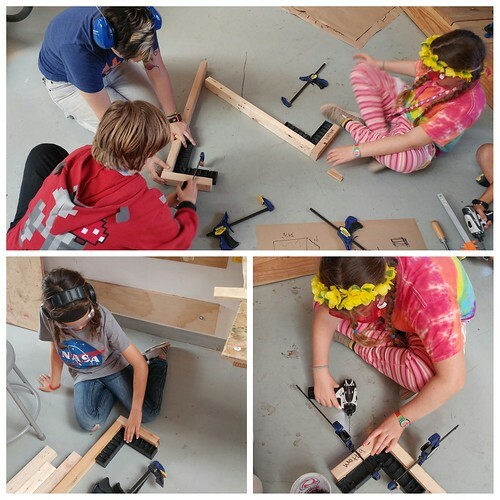 The Teal Band began its group project of Brightworks on a Bus (BOAB.) 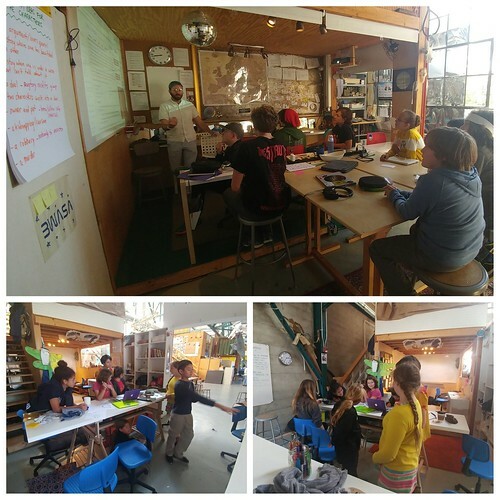 The launch of the process began with a brainstorm on what it is that makes Brightworks, Brightworks, and organizing the ideas into three main categories; ideas, objects, and spaces. Knowing that a bus is quite a lot smaller than the school building itself, the band looked at which spaces could hold multiple functions. After coming up with three main spaces, the band learned to bubble diagram, a freehand diagrammatic drawing made by architects and interior designers to be used for space planning and organization at the preliminary phase of the design process. 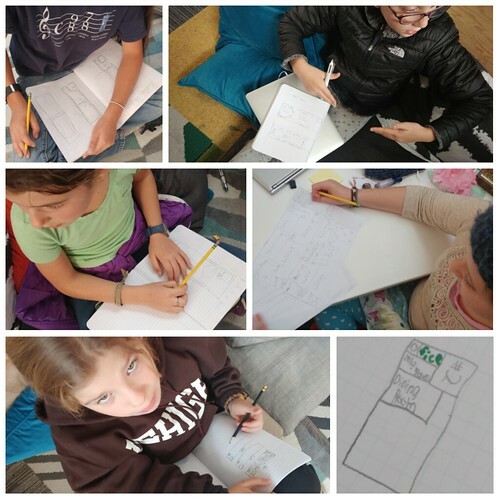 They each created a couple bubble diagrams, looking at how spaces and functions interacted with one another, before working together to combine multiple ideas. Next steps include drafting designs to scale and building models. What makes Brightworks, Brightworks? 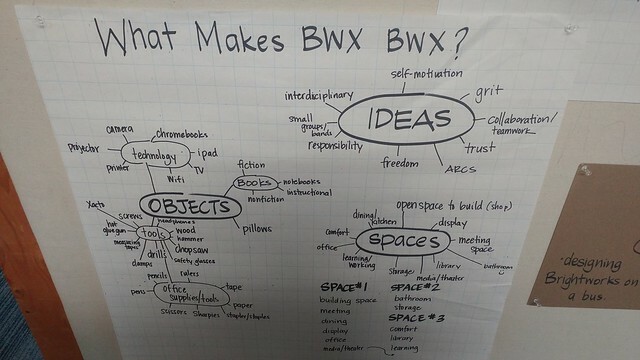 We brainstormed the ideas, spaces, and objects that make Brightworks unique and possible to function. Teal learned to bubble diagram in order to quickly sketch out a number of design ideas. 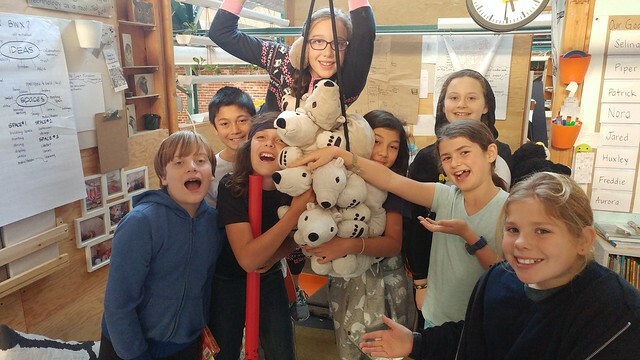 On top of all this, the Teal Band continued to write their novels, and on December 1st, they celebrated the end of the writing period of NaNoWriMo with a visit from the whole Polar Bear Clan. Congrats to all the authors…now to become editors. The Polar Bear Clan came to celebrate the end of NaNoWriMo with the Teal Band. These last two weeks have been quite an adventure for the Teal Band and the US. To start out, the Teal Band took a look at the results of their “Getting to School” questionnaire they had received so far. It was exciting to look at the data collected about the parents’ journeys to school, as well as where they were living at their child’s age. They noticed how many more parents traveled to school on their own or with friends, compared to the students of Brightworks, where the majority of the kids are arriving by car. 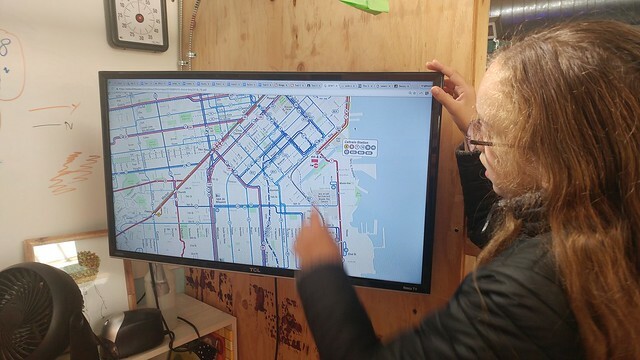 They also began brainstorming new ways to use the data, such as planning car and walkpools to minimize the carbon footprint of getting to Brightworks. Looking at where the parents who completed the questionnaire lived as kids and brainstorming what information and provocations can come about from the results. Looking at some of the numbers associated with the “Getting to School” questionnaire. 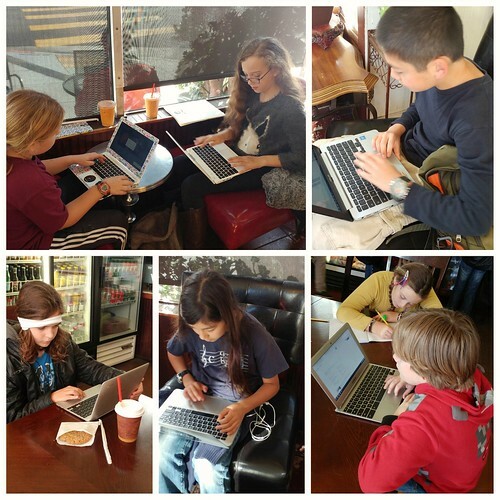 We saw the official launch of NaNoWriMo on November 1st and celebrated this by walking to Maxfield’s Cafe to write among the other adults there on their computers. While being incredibly productive, everyone enjoyed the treats they bought to eat and were excited when they saw a woman in there wearing her “2015 NaNoWriMo Winner” t-shirt. Lauching NaNoWriMo writing in a cafe. 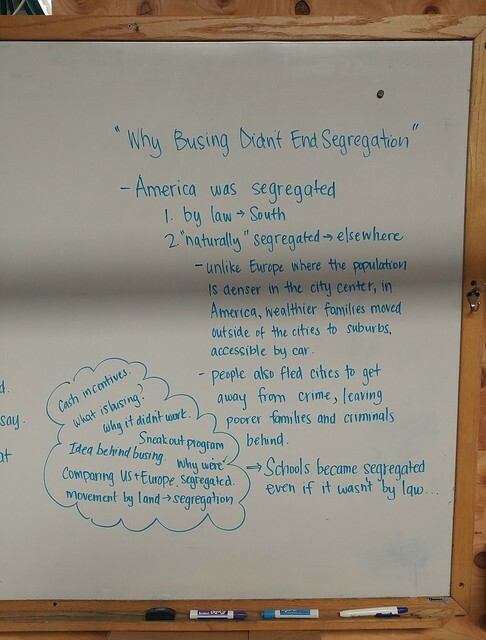 As part of our exploration around the movement of education by land, we began looking into the busing that swept the US in the 60s and 70s, attempting to desegregate schools. 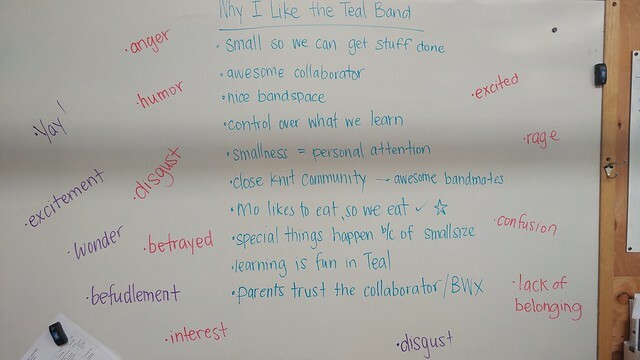 Teal Band listed why they like being in Teal Band and why they are comfortable being where they are. Soon the band was being “bused” off to new schools, the Amber and Indigo Bands. Their initial reactions were largely that of excitement and wonder. Once they returned to the Teal Band, their reactions had flipped and many said they felt a lack of belonging and confusion. We discussed how something that was intended to “make things better” could have such a different outcome. What happens when you love your school and community but are forced to leave it? A lot of feelings. Our new “schools” we were bused to, a.k.a. the Amber and Indigo bands. With Election Day on November 8th, we spent a full day reviewing 13 of the California propositions. They asked all the hard questions to get to the heart of each proposition. Where is this money coming from? What other group(s) will be losing out as a result? Who is backing this? Who is opposing it? It was amazing to hear from all the families how much their child helped them look deeper at their vote as a result of our conversations. The results of our research and votes on a number of California’s propositions. Teal Band was tasked with finding our way for our field trip using the Muni map and schedule. 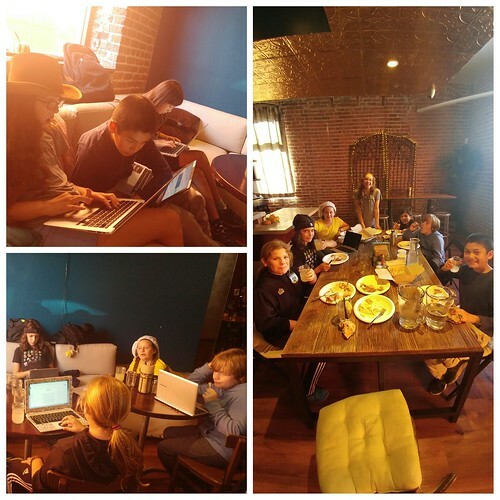 A new spot to work on NaNoWriMo also includes grits and fried chicken. After listening to a podcast entitled, “Why Busing Didn’t End Segregation,” on the Boston busing program, we also watched a video on why we live where we live in an attempt to see how urban geography creates segregation. We saw how particular groups of people end up in certain areas as the result of transportation and the layout of cities and suburbs. We discussed how it was this sort of “natural segregation” that led to busing programs in parts of the country where segregation was not originally law. 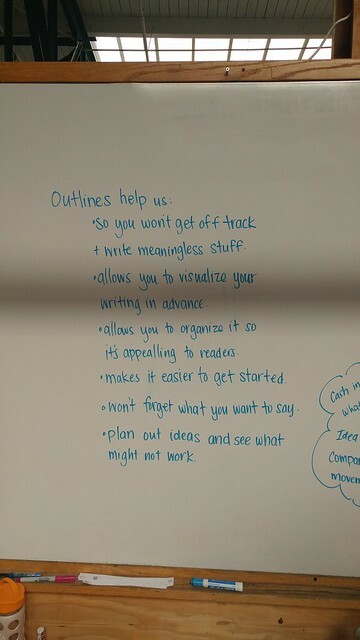 On Friday, we spent some time looking at how we can use outlines to help us organize our thoughts before writing and used these skills to reflect on the discussion we had the day before on busing and segregation. We will continue to work on outlining to organize our thoughts, notes and writing. 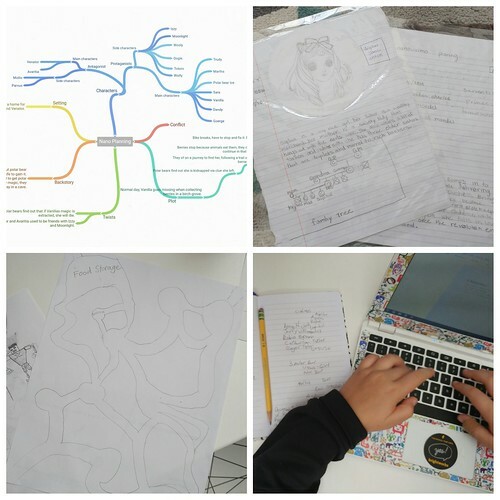 Using outlines help us in so many ways. After an amazing week in the Mendocino Woodlands, the Teal Band had to come back to the reality that is Brightworks and the start of a new arc and the launch of NaNoWriMo. They began their week with a visit from Piper’s father Evan, who shared his process of writing children’s picture books. The story of writing his first book, shared with the band ways to look to their personal experiences for story ideas, even if the story takes you to a fantastical world where animals talk, drive trucks, and hold down jobs. 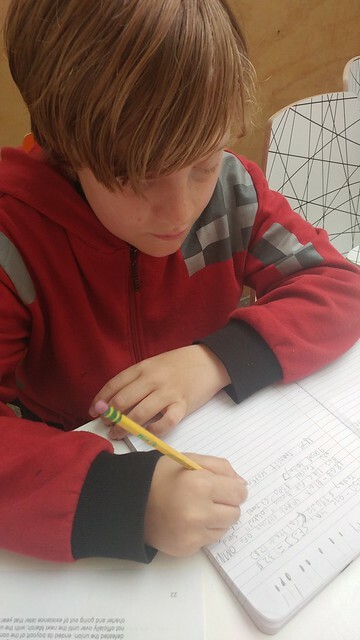 During the remainder of the week, the band looked at elements of writing, character development, and plot lines. 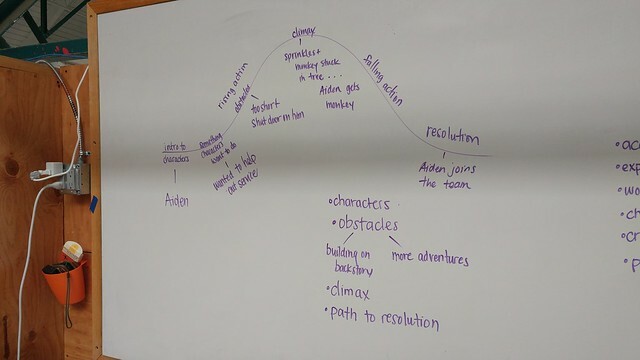 They mapped out the plot of Evan’s Giraffe Rescue Service, seeing it as a rollercoaster, with the climax of the story peaking at the top of the first hill. 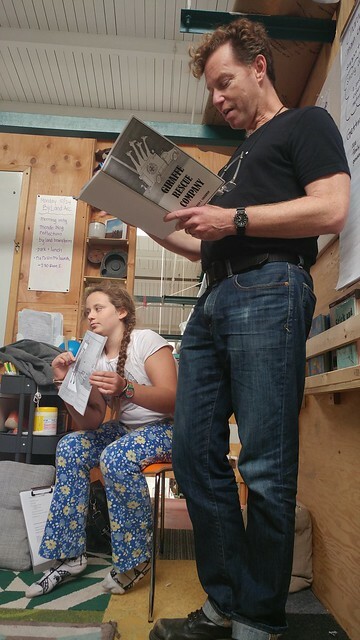 Piper shares the illustrations drawn by her dad, as he reads his book ‘Giraffe Rescue Service’ to the Teal and Blue bands. Using ‘Giraffe Rescue Service,’ the Teal Band looked at the rollercoaster ride that is a plot line. Planning for NaNoWriMo is in full swing. Everyone has their own way of planning for NaNoWriMo. On Tuesday afternoon, we had the opportunity to hear from a few members of the Mission District and Bernal Heights’ Hispanic communities. 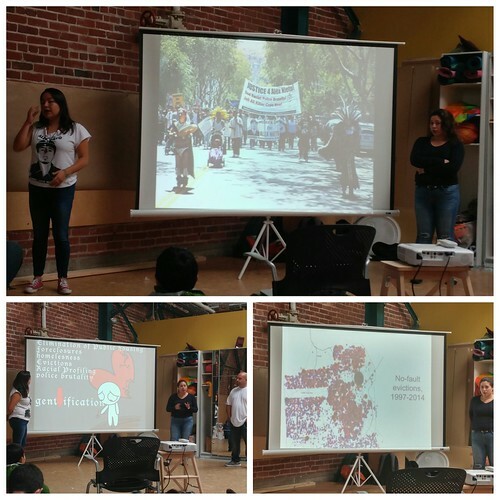 They shared their connection to Alex Nieto and his story in preparation for those attending Loco Bloco’s play, “On the Hill: I am Alex Nieto.” They also shared stories of others in the community, many of whom are greatly affected by the gentrification occurring in San Francisco. This is not always an easy conversation to have, but it is an important one that we will continue throughout the year and for years to come. Hearing the stories of Alex Nieto and the gentrification of San Francisco. On our way to catch BART on Wednesday morning, we took a slight detour down Clarion Alley. This alley sits between Mission Street, a street that still holds on to much of its original Mission District roots, and Valencia Street, one that has seen a lot of change due to gentrification. It is home to numerous murals painted by the Clarion Alley Mural Project. We took the time to stop and look at a few that addressed struggles of San Francisco and the changes its facing as its population continues to grow. 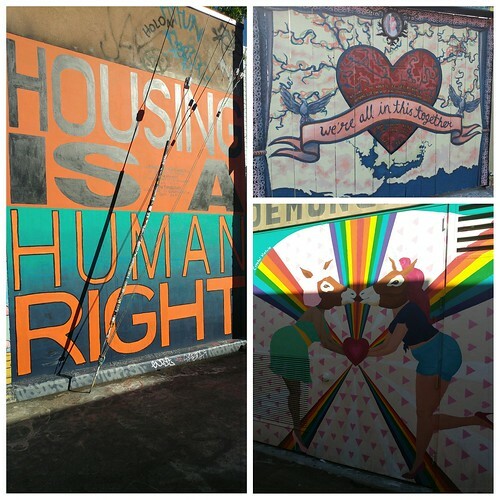 Murals on Clarion Alley, making a statement about San Francisco. 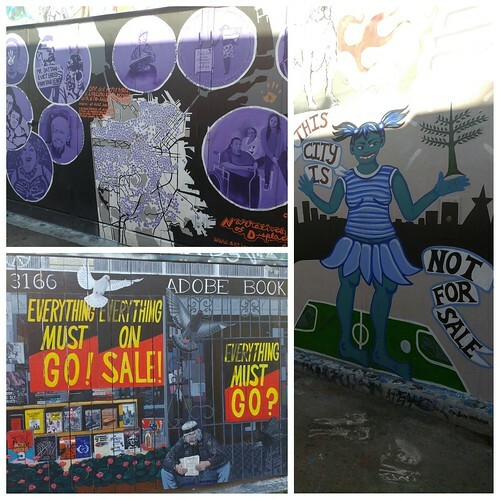 More Clarion Alley murals getting their message across through art. While we are not passing elephants, riding horses or walking upwards of four hours, each of us makes a journey to school everyday and we will be looking into those journeys, how they affect us, and the effects they have on others and the planet. 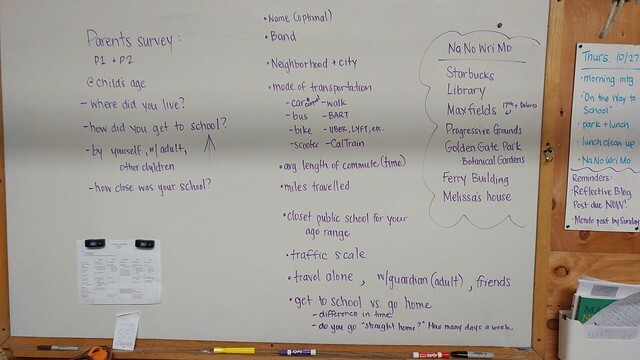 One of the ways the Teal Band will be looking at these journeys to school is by collecting data using a school wide questionnaire. 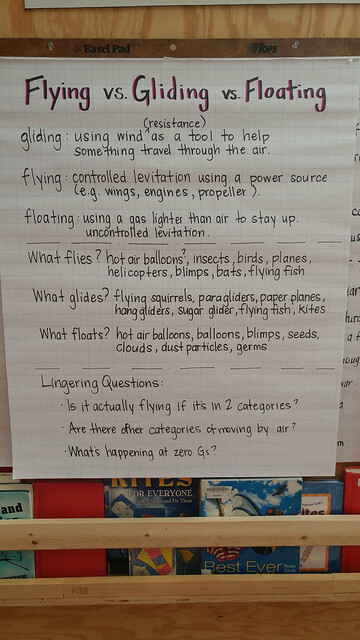 On Friday morning they brainstormed a number of questions they felt would lead to strong explorations and provocations, and created a Google Form. They are interested in comparing the journeys of the students of Brightworks to those of their parents. Brainstorming questions for the Getting to School questionnaire. We wrapped up the week with a bit more work on our bridge storage wall. 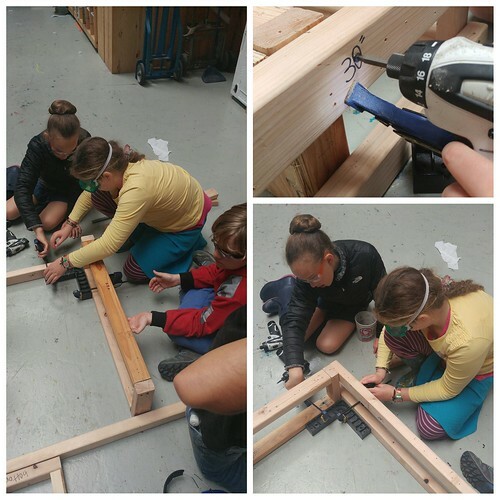 They worked as a team to support one another as they constructed the frame and cut and attached the shelves. Progress is being made. It takes teamwork to make sure the shelf frame is screwed together squarely. It also takes teamwork to make sure the shelves are just right so they will fit the frame. These last two weeks have seen iterations two and three of our tetrahedral kite. 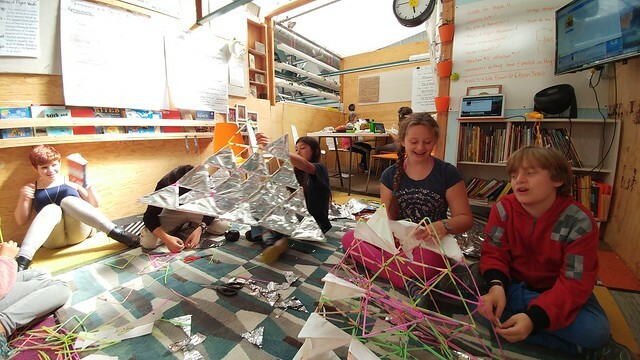 After reflecting on kite one, the Teal Band knew they needed to solve the problems caused by so many string connections which loosened during flight, as well as address the time factor it took to construct the kite. After some hands-on exploration of the materials and online research, it was discovered that the string could be eliminated completely by simply inserting one end of the straw into the end of another, three times over, and closing off the shape to create a triangle. With the time spent studying tetrahedrons, the band quickly saw ways to create one tetrahedron using only two triangles and building off of others to create the other two faces. This method cut down on construction time greatly, allowing them to build a kite in about one day instead of three. 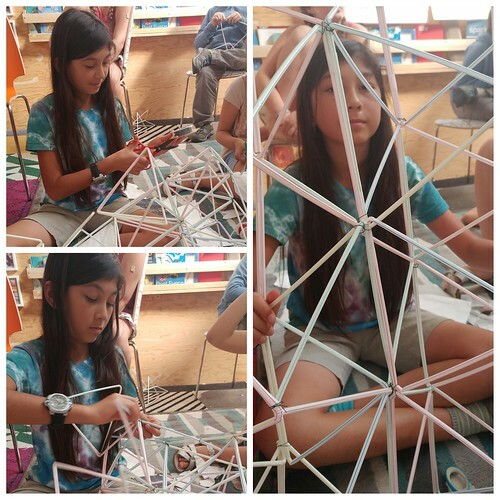 Selina spent a lot of time building and exploring our new tetrahedral structure. Another issue that arose with the initial kite was how delicate the tissue paper was. The band wanted to improve on its performance and after some research, which also included trying out mylar, they settled on Tyvek. The Tyvek was found to be an incredibly sturdy material and was quite easy to affix to the kite’s straw structure. Iteration #2 saw a move from tissue paper to Tyvek in order to improve on the strength of the materials. Unfortunately, the afternoon we chose to fly our second iteration up on Bernal Hill, the wind was incredibly strong and it wreaked havoc on our kite. The amazing thing was that it continued to fly even after the straws began to pull apart from one another. 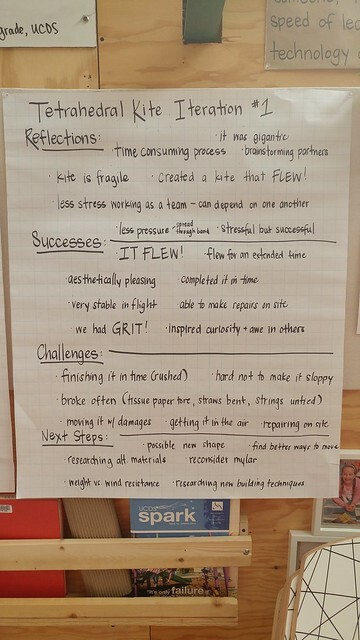 While it initially felt like a failure, a reflection on the kite’s construction, materials, and flight brought to light the successes and next steps. Kite #2 after attempting to fly it on an incredibly windy afternoon on Bernal Hill. The band decided to keep the basic design and construction methods the same for the third iteration, which included two kites. The biggest overall change that was made included taping the straws together at their connection points. Huxley was incredibly interested in seeing how the scale of the tetrahedron also played into its stability. This is how the second kite came to be. 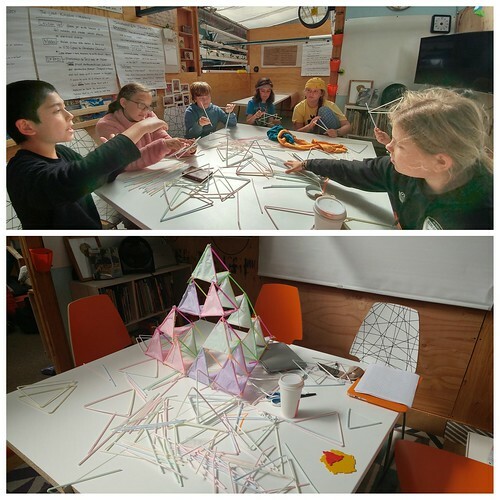 The straws were cut shorter, creating smaller tetrahedral structures. The band also decided to use mylar from emergency blankets to create the sails for this kite and continued to use Tyvek on the other, larger kite. Jared and Huxley were luckily able to salvage a fair amount of Tyvek from the second kite to use on the third. 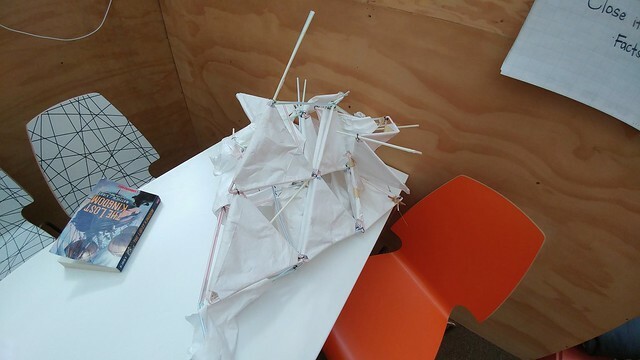 Two different materials were used for the third iteration of the kites. The larger kite still used Tyvek, while the smaller kite used mylar. 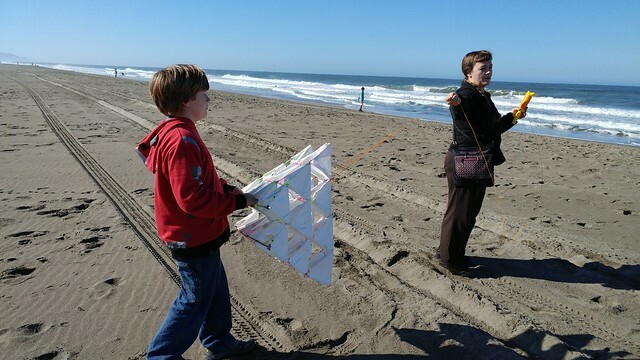 With the completion of our two third iteration kites, we took them to Ocean Beach in hopes of finding a good ocean breeze to send them soaring. Our sunny San Francisco October days certainly seem to have it out for us now. There was zero wind. The band made multiple attempts to get them off the ground, racing up and down the beach. Neither of them made it very far into the air, but the movements they did make give us hope for a successful future flight. 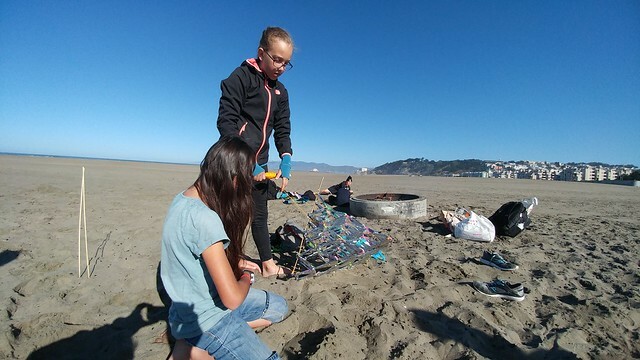 Aurora and Selina put the finishing touches on the smaller kite at Ocean Beach. Bamboo rods helped keep the kite’s structure. Jared and his mom worked as a team to try and get the larger kite to fly. Unfortunately, the wind wasn’t on our side and with no wind, it didn’t fly. When we weren’t building our kites or attempting to fly them, we were “playing” with paper airplanes. The Teal Band experimented with a number of designs and eventually found “The Moth” to be a stable and sturdy plane. Once the planes were built, we discussed multiple ways we could test their flight and measure particular outcomes. We measured distances flow, heights thrown from, length of flight time, wing surface area, and multiple other constants and variables. After selecting a constant and a variable, the data was measured and recorded in a table, then transferred to a graph. One observation that really stood out to the band, was how much thrust (how hard the “pilot” threw the plane) played a part in the plane’s flight path and distance flown. 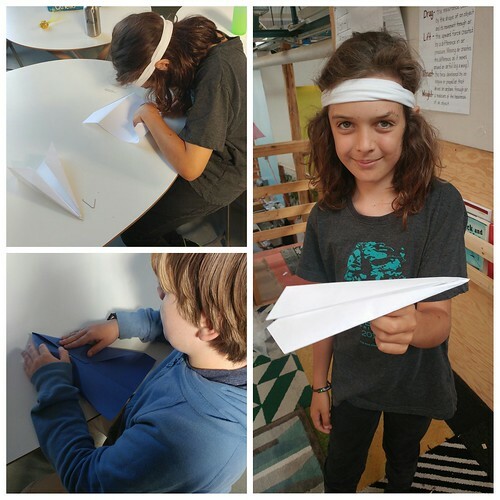 Working with paper airplanes allowed us to look at the forces of flight, along with controlled experiments and graphing. 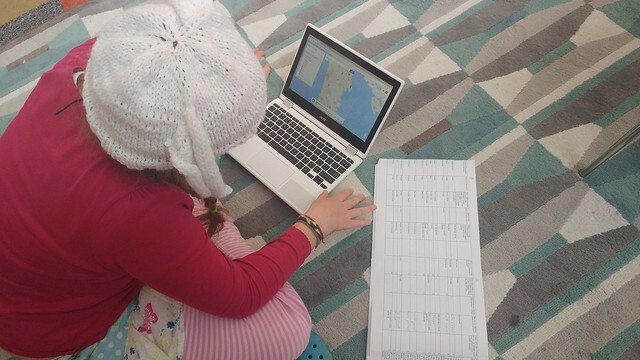 Charts and graphs were created using the data collected from the planes’ flights. The redesign of the bridge between the Teal bandspace and the library has moved into its construction phase. Once it was decided that the bridge needed to incorporate some storage space, the band worked to design a shelving system that will eventually hold their “favorite books.” Observing Amanda’s shelf she built for the shop provided inspiration, leading to construction drawings, measurements and cut lists. 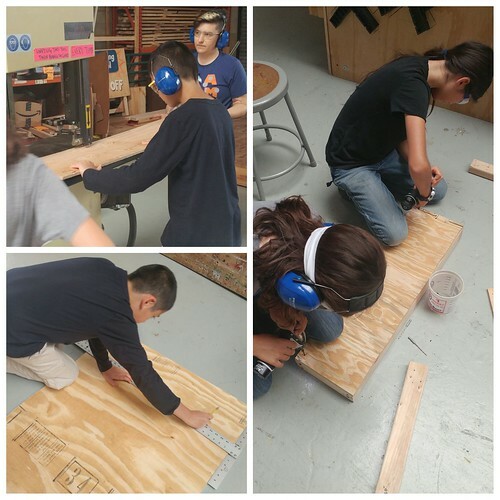 Using all their building skills, the Teal Band was able to cut all 2x3s for the shelf and begin carefully assembling it so that it is completely square. 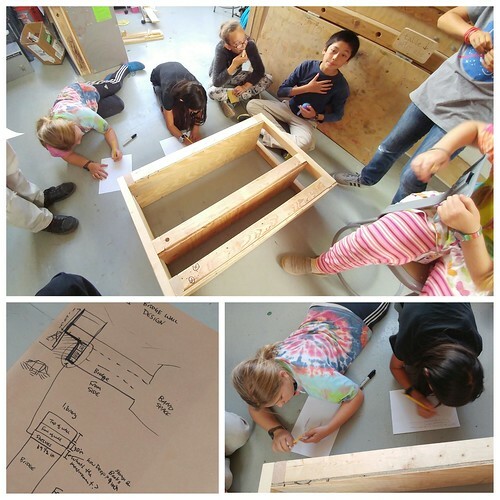 The first steps in constructing the bridge wall included sketching out a shelving system. Amanda’s shelf served as inspiration, though it didn’t come with instructions. All the proper tools were used to make sure the shelving components would be nice and square. Anyone who puts in this much work deserves something special. For that reason, after attempting to fly their kites at Ocean Beach, the Teal Band got to have tostadas at my house. They were definitely enjoyed. Who knew a band of 10 and 11 year olds could go through a jar of jalapeños? I do now. 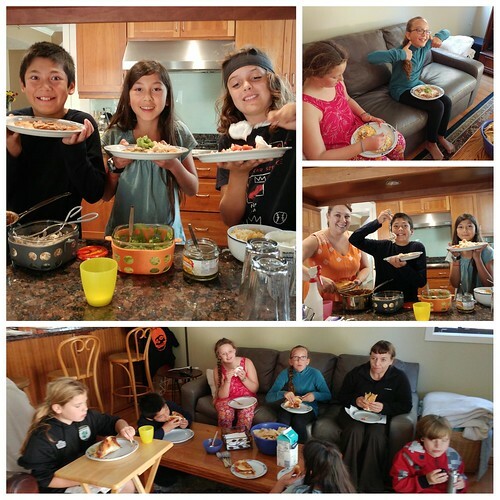 Our special experience for the week included tostadas at my house after our morning trip to the beach. After the success of the first iteration of their tetrahedral kite, the Teal Band decided to move forward with a second iteration. 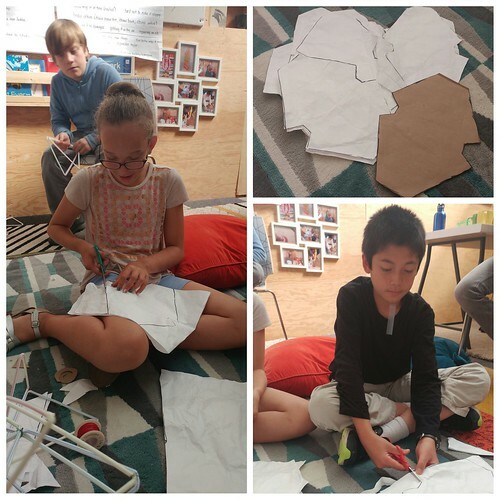 On Monday, they reflected on their experiences making and flying the kite and the construction of the kite itself. 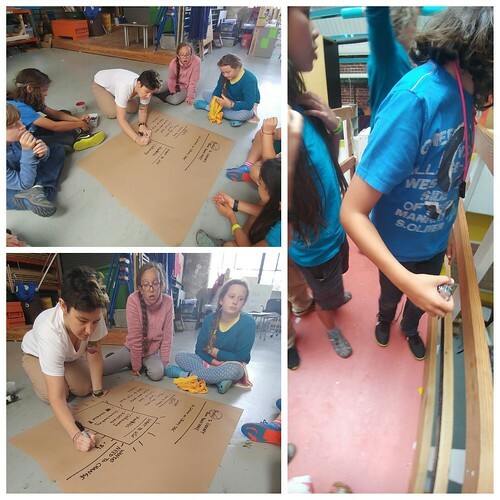 After brainstorming successes and challenges, they came up with a number of next steps to improve on the kite’s design and construction. Teal Band reflected on the first iteration of their tetrahedral kite in preparation for their second iteration. Exploring a new way to construct the tetrahedrons with stronger vertex corners by eliminating the string all together. While reading Math Curse by Jon Sciezska the previous week, we stumbled upon a math problem we wanted to solve: How much would it cost to measure the length of the Mississippi River in M&Ms? They had already found that it would take 400 million M&Ms to measure, but how much do 400 million M&Ms cost. They were pretty certain that not all bags of M&Ms contained the same number, so they settled on counting 6 bags and taking an average. 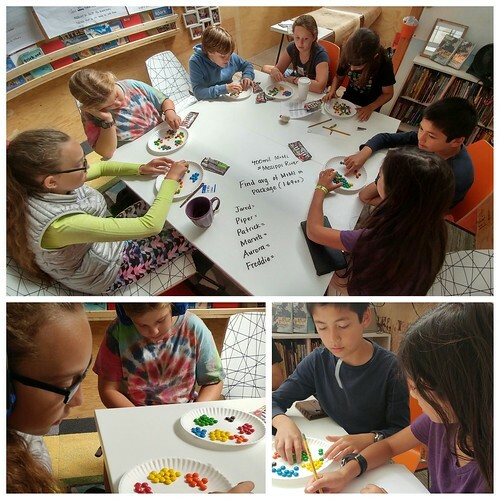 After work around averages, some major long division, and multiplication, they figured out that it would cost $9,381,817.83 to buy enough M&Ms at regular price or $3,636,363,50 at the sale price we bought them at. We decided against actually measuring it and saving those millions for a new building for Brightworks. After reading Math Curse last week, the Teal Band wanted to figure out how much it would cost to measure the length of the Mississippi River in M&Ms. We also took a look at the surface area of the triangles that make up the kite’s tetrahedrons. After exploring the triangles for a bit, they discovered that they could turn the triangle into a rectangle by cutting it in half and putting the two halves back together in another configuration to recreate the whole. 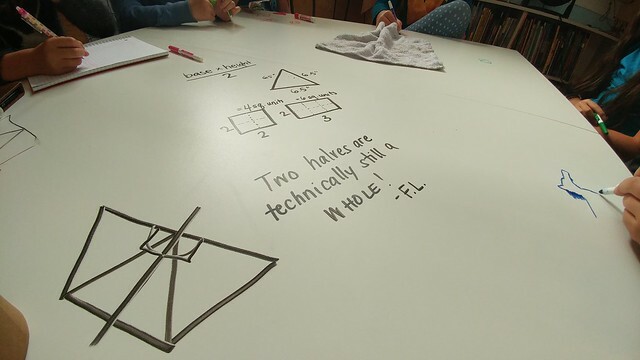 Knowing that the area of a rectangle can be found by multiplying the width by the height, the Teal Band also worked to find the hypotenuse of the right triangles they had created when they cut the equilateral triangle in half, as that had become the height of their rectangle. 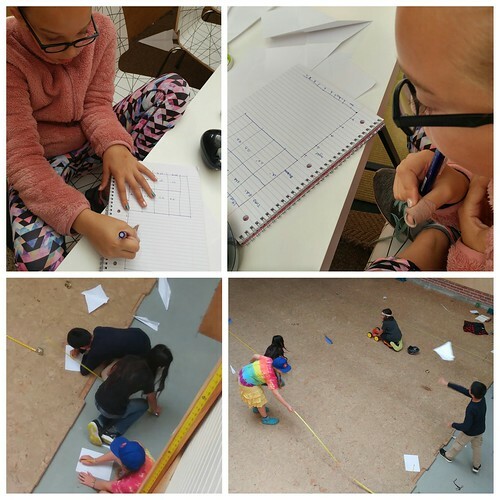 The Teal Band explored ways to find the surface area of the triangles that make up their kite’s tetrahedrons. With our Mendocino trip only weeks away, a few students are already making requests for cabin mates, cabin leaders, trail groups and more. These requests provided the perfect opportunity for the Teal Band to work on their persuasive writing skills. This coming week, they will work to help peer edit one another’s work. Everyone in the Teal Band is working on a persuasive letter to someone else in the Brightworks community. The “bridge” between the Teal band space and the library is in need of a major facelift and the Teal Band has been tasked with taking that on. On Wednesday, we met with Amanda Simons to brainstorm. They listed how it is currently used, how they want to use it, and what they want to change. Everyone wanted to jump straight to their design ideas, but we are taking our time and doing this right. It’s hard to create a true design if you don’t have the measurements and a drawing of the space as is. This coming week, we will move onto the physical design. They cannot wait. The first steps to updating the bridge between the band space and the library with Amanda. We wrapped up the week with a conversation around flying vs. gliding vs. floating. They worked together to define each of the three. It was not an easy task, but one that we had been touching on daily since day one. 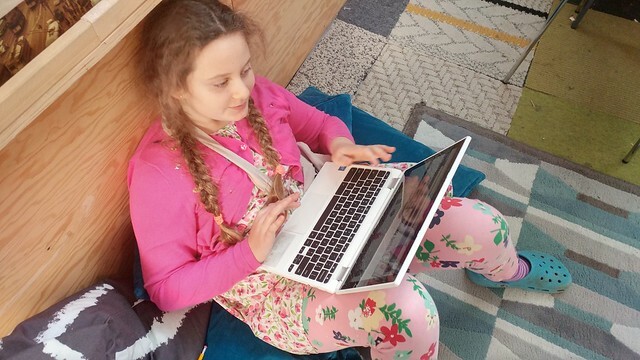 To expand on their thoughts around these concepts, each Teal bander wrote a blog post stemming from this discussion. 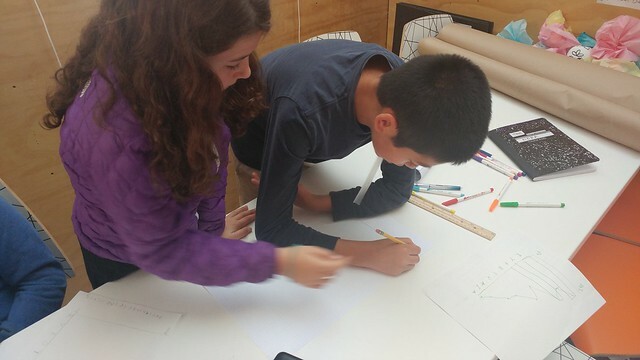 This coming week, the Teal Band will continue on with the design of the second iteration of their kite. We cannot wait to get it in the air.